Home Products Mellerware Panini Press 2 Slice Stainless Steel Black Grill Plate 800W "Compacto"
Mellerware Panini Press 2 Slice Stainless Steel Black Grill Plate 800W "Compacto"
Savour delicious tastes in your very own home with the Compacto 2 Slice Panini Press. 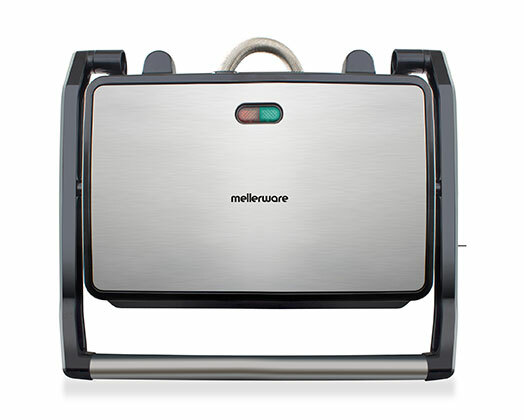 The Mellerware Compacto 2 Slice Panini Press has non-stick grill plates which makes it ideal for grilling. The Compacto Panini Press is equipped with a lock system so storage is a breeze. Cleaning up is also easy with the drip cup that is included. With a power and ready indicator light there is no guess work as to when your panini press is ready to use.